Repetition is necessary to gain a mastery of a technique or skill. Demonstration's also require repetition in order for players to have a model version to aspire to. Furthermore, allowing players to repeat a corrected version can help overwrite mistakes made. By repeating sessions, coaches can build on previous learning as well as decrease instruction/increase time within activities. Player's need repetition in order to gain a mastery of a skill or technique. It takes time to allow players to repeat the move and develop it, as well as working on the other foot! This can be challenging for coaches to keep players engaged as repetition is often linked with boredom. Having a variety of activities and twists on games can really help to continue getting repetition while engaging the players. In the above example, player's get plenty of repetition. However, after a while, this may not be the most fun. 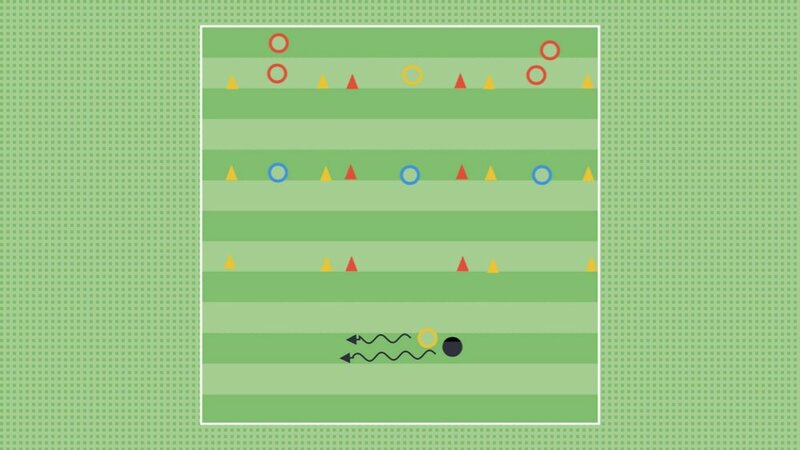 In the second example, players still work on close control in a tight area, but also look to identify spaces to penetrate and score points. This keeps the game more interesting and can be tweaked to maintain engagement of players. While repeating a technique over and over again will allow players to master 'how' to do something, it alone is not enough. For a technique to become a skill, players need to be able to apply it in the context of the game. Once a player understands the where, when and why of a move (under pressure) then we've progressed from individual technique to a skill. The above game has two target players and a neutral for the team in possession. 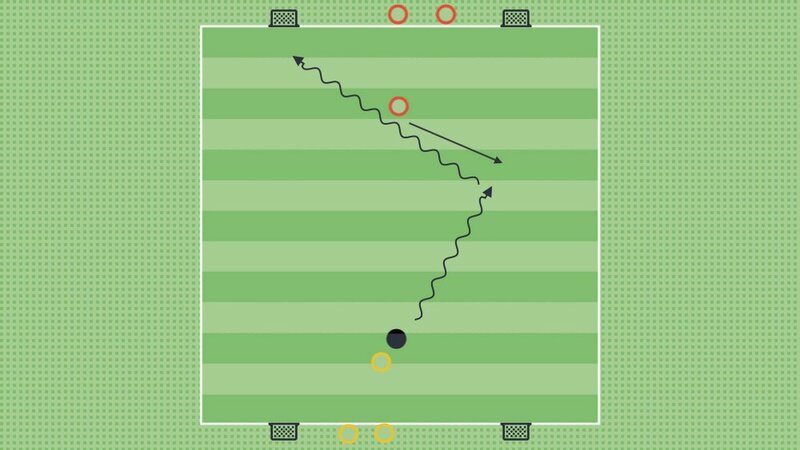 Player's will find themselves in scenarios where they can try and "Receive to Turn" (the session topic) and play forwards. It might be that the scenario changes based on the pressure. This allows the players to come up with their own solutions and coaches the chance to address the 'what if?' questions. While learning styles are currently being feverishly debunked by teachers across all different areas of expertise, there is one component that will never leave coaching: visuals. Demonstration's are important for showing player's what you're looking for, giving them a model version to aspire to and breaking technique's down for players. In the above activity, the coach demonstrates the 'Ronaldo Chop' with his left foot. The coach then returns back and shows it with his right foot. (Alternatively, he might do the first demo slowly and the second demo at game speed). When making interventions, a number of coaches focus on correcting players. If a player makes a mistake, the coach may work individually with that player on fixing said issue, have them try it, and then return them to the session. If we take this approach, players have one repetition of doing it incorrectly (if we caught it straight away) and one repetition of the the correct version. In order to remedy this, coaches should consider having player's do multiple repetition's of the correct version to overwrite their previous experiences of performing the technique. This way, players are rewriting and increasing, their muscle memory for completing the move correctly. The coach works 1 on 1 with the yellow player on his 'Inside Outside' move which just broke down. The coach then has the player try it successfully 2 or 3 times before returning to the activity. When running a session for the first time, it is common to spend a decent amount of time explaining activities and making interventions to tweak activities/games. This can take away time from coaching and player's number of repetitions. Repeating a session, especially one that requires a lot of explaining, allows more playing time as there is less need for instruction. This means less time figuring out the activity, and more time working on the theme of the session.